Australian gamers will be amongst the first in the world to dive into Gears Of War 4 when the game launches exclusively on Xbox One this October, with a special Ultimate Edition offering diehard grunts the chance to play the game four days before release. The Gears Of War 4 Ultimate Edition is now available for pre-order on the Xbox One store, and will unlock for those that pre-ordered on October 7, 2016, four days before the global October 11 release. Both the Standard and Ultimate Editions of Gears of War 4 offer fans who pre-order an exclusive Vintage Del Gear Pack featuring a Vintage Del character model, emblem, two Vintage weapon skins and a special Vintage Del bounty as an added bonus. Xbox gamers had a sneak peak at Gears Of War 4‘s multiplayer, with an open beta now live for Xbox live Gold subscribers. 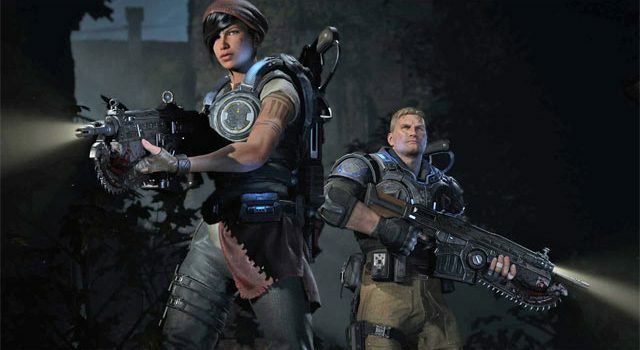 This Gears entry, the fifth, and first from developer The Coalition, takes place 25 years after the Imulsion Countermeasure weapon destroyed the Locust, Lambent and Imulsion on the planet Sera, but it also knocked out the use of fossil fuels, forcing humanity to adapt new ways for survival. For those who fork out for the Ultimate Edition, Gears of War 4 is available from October 7. Those who look to the standard edition can jump in from October 11.